Mary Doherty, pictured above, comes from Bocan in Inishowen, an area steeped in legend and history. 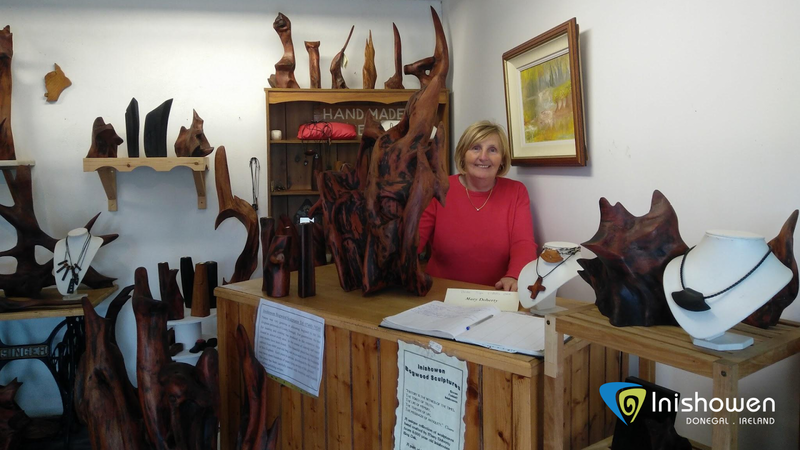 Using bogwood, an ancient material found on the landscape, Mary crafts beautiful wooden sculptures. 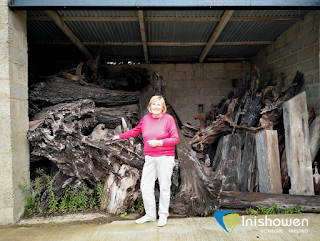 Mary had "always wanted to work with wood" and in 1993 attended a week long course on Bogwood Sculpture at Esker Redemptorist Monastery in Athenry. Following the course, Mary has perfected her craft over the past 22 years. 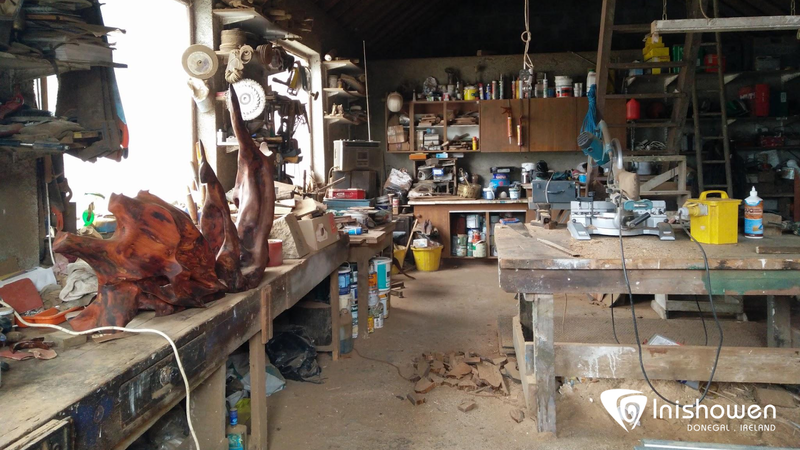 With a growing collection of sculptures, Marys husband Sean, a Joiner and Carpenter, built a studio on the grounds, see below, to display the unique collection of bogwood. Bogwood originates from forests that once grew in this area 1000s of years ago. The forests consisted of oak, yew and pine and grew where bog land now exists. Over time, the wood has decayed and undergone a process of chemical change which gives the wood its unique colour and texture. The bogwood that is crafted has come to the surface due to turf cutting. Turf is extracted from these bogs and used in Ireland as a fuel source. You can see from the image above that the sculptures on display are of a variety of colours and sizes. Over the years bog oak changes to a striking black, yew to a reddish brown and pine to a golden yellow. Once Mary has located the bogwood it is brought back and stored in an open shelter, pictured below, where it will dry naturally. As you will find out during your visit, the drying process can take between 3 to 5 years. Click below to learn about Marys first piece of sculpted Bogwood. 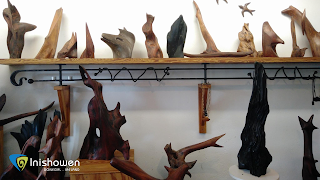 During your visit you will have the opportunity to see this piece and the different areas the wood is stored and sculpted. With encouragement from friends and family Mary began to exhibit her work at local craft fairs and soon her work was in high demand. To date Mary has exhibited all over the world and has been commissioned, to name but a few, to make pieces for John Hume, a co-recipient of the Nobel Peace Prize, Peter Robinson, First Minister of Northern Ireland and Jean Kennedy Smith, a previous Ambassador for the United States. 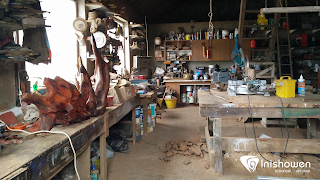 Mary has a connection to each piece she creates stating that “When I number the sculpture I give it a name but I don’t share this with my customers because I like them to tell me what they see in the sculpture, as everyone sees them differently”. 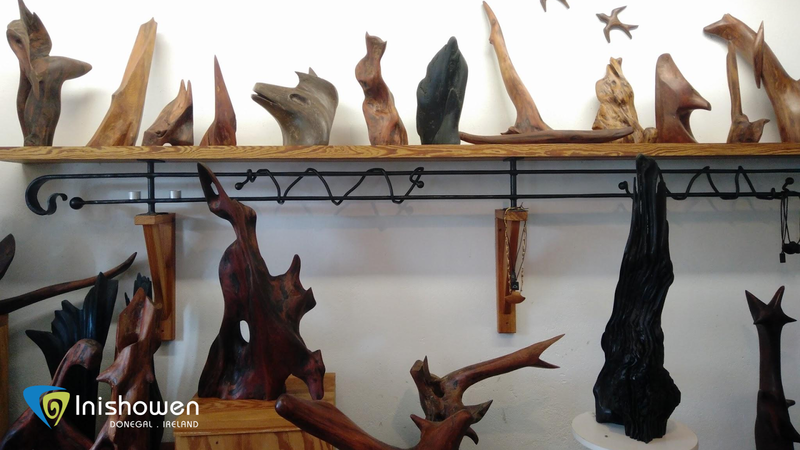 During your visit you can expect to find curious shapes in each piece adding to the unique nature of the wood carefully crafted by Mary. As a result of the skill and craftsmanship you will see at the Studio, Marys bogwood sculptures has been shipped globally. On a visit to the studio you will leave with a newfound appreciation of her craft and of the ancient landscape from which it is taken.